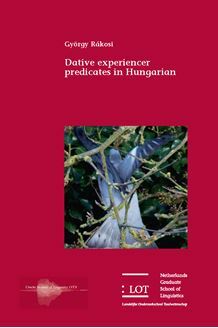 Dative experiencer predicates in Hungarian investigates the argument structure and the syntax of appeal to- and important-type predicates in Hungarian. Couched in terms of Reinhart’s (2000, 2002) Theta System, the thesis presents arguments for the need to resort to the lexicon in setting up systematic generalizations concerning the licensing and the basic syntactic behavior of dative experiencers. Dative experiencer predicates are distinct both conceptually and thematically from subject- and object-experiencers, and the three classes of predicates cannot be collapsed at any level of representation. Dative experiencers themselves can be of three distinct grammatical types. Appeal to-type predicates have dative experiencer arguments, but important-type predicates license dative thematic adjuncts, which are optional and which have distinctive semantic, morphological, and syntactic properties. A general account of thematic adjuncts is developed. Non-thematic datives are distinguished as a third type of dative experiencers. These can freely be inserted into any clause as regular adjuncts. A fresh look is taken from this perspective at the syntax of dative experiencer constructions in Hungarian. Hungarian dative experiencer predicates are shown to be non-quirky. Their peculiar syntactic behavior is the consequence of their special thematic properties. In addition, the argument - thematic adjunct distinction helps the author to reconsider the role dative phrases play in agreement-marked infinitival constructions in Hungarian. This thesis is of relevance to scholars working on experiencer predicates, dative case, and quirky subjects in particular; and to scholars interested in argument structure, lexicalist theories, and the argument - adjunct distinction in general.